Cabin, lean-to or tent site? Hiking, swimming or fishing? Family getaway? Solo retreat? 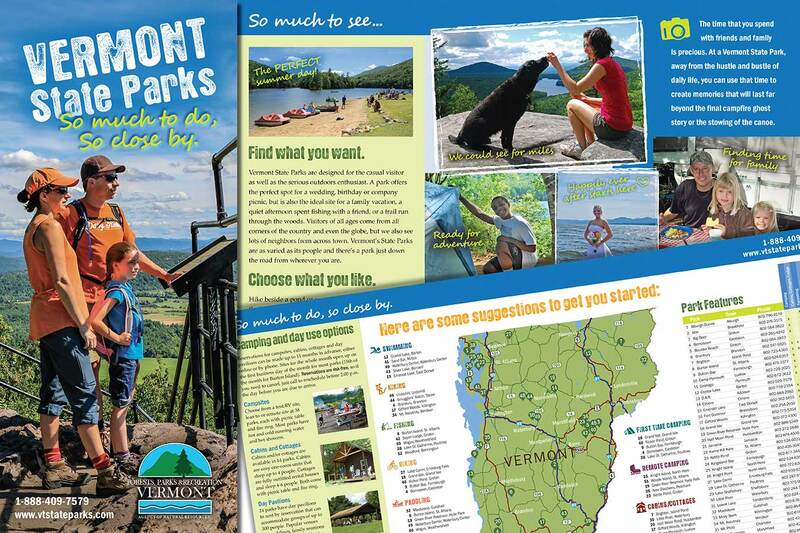 With so many great options to choose from, the CMO has helped State Parks design of a consumer brochure to appeal to many interests. Any marketing endeavor should begin with a careful assessment of goals, key message points, target audience, budget, timeline, and performance metrics. If you are new to state government — or new to marketing state programs — and aren’t sure where to begin, we can help. We support outreach and marketing activities within individual state agencies and departments by providing strategic expertise (marketing planning) and tactical support (graphic design, copywriting, etc.). We can provide some ‘in-house’ creative services, and we can also refer agencies or departments to pre-qualified marketing vendors and master contractors for additional marketing and creative services. Our centralized services enhance the efficiency and effectiveness of state marketing efforts through collaboration across state government, the use of consistent state branding, providing access to aggregated services and master contracts, and by leveraging public/private partnerships. So when it comes time to design a website, print a brochure or launch an ad campaign, please make the Chief Marketing Office your first call. (In fact, if your project cost exceeds $25,000, we are required to sign off on your project, per State Contracting Requirements). Involving us from the beginning ensures that we’re all on the same page and that you don’t have to revise creative materials or contracts down the road. Our goal is not to interfere with your project, but to offer advice that will help you succeed, make the most of the budget you have available and make sure the State of Vermont is professionally represented. We have a variety of resources available, so please, contact us so we can discuss your needs.